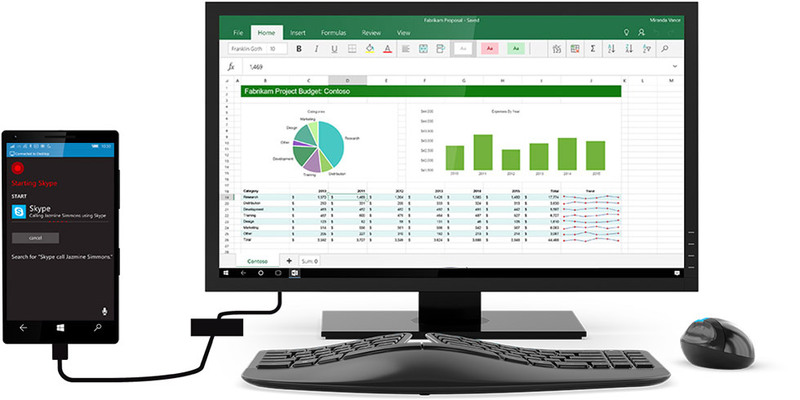 Microsoft Continuum for phones allows you to connect your phone either wired or wirelessly to a monitor or TV. This allows the user to view their information on the big screen. Not such a big deal. But what if this device also allows us to connect a keyboard and mouse ? Now we have interactivity with our phone with standard desktop devices-getting clever. Tie that in with your PIP hosted/cloud application or remote desktop and you now have portable computer that just works where ever you go. Just think you can walk up to any desk, kiosk, library or café have your phone in your pocked connect wirelessly to the “Terminal” and just continue working. No more dedicated P.C’s around the home. Not having to share that notebook with separate profiles and the risk of infecting it with viruses ruining everyone else’s work and productivity. or you might still have a dedicated screen and keyboard in a quite place for some serious homework or work that you are continuing from the office. Seamless change over and privacy between users. Complete security as any information and authentication methods are all part of your phone. The opportunity to work from any room any time. PIP provides hundreds of Medical Practitioner’s with access and support to their Medical Software each day. Typically a specialist, doctor, nurse or assistant has a dedicated login to a computer at each practice the specialist or doctor may visit. This connects them to their PIP practice in the cloud or “Portable Practice” as we have aptly named it. This login needs to be secure and remembered by all relevant users. This of course is also duplicated at the home for after hours consultation’s and accounting purposes. All these P.C’s need to be maintained, updated, kept secure, virus clean and probably most importantly, they actually needed to be purchased in the first place and then replaced regularly. Why don’t we eliminate these dust collecting, electricity drawing, maintenance holes, we call P.C’s? Lets imagine where we would be then. The specialist or doctor arrives, there is a screen, keyboard and mouse (terminal) on his desk. He uses his fingerprint on the screen of his phone and logs in. The terminal comes to life with everything open on his desktop as he left it that morning whilst having a coffee on his home lounge that morning. After doing the morning session, he heads of to the hospital for some surgery. He logs onto his phone, again his desktop is as he left it. He uses the phone like a tablet and takes a last look at some new images that have arrived from pathology. If he needs to see them on a bigger screen all he need do is find one and have his phone in wireless range. There is no need to worry about logins, what/who’s internet if any the computer has, firewalls or privacy concerns. Of course if the hospital or nursing home did not have the technology for the doctor to dock his phone either wired or wirelessly the Doctor can still connect to his cloud desktop from standard P.C and again his desktop will be there just as he had left it previously. Our specialist or doctor now goes home, his partner is already utilising the terminal in the den to complete the days accounts. So our doctor connects to the TV wirelessly to tidy up the loose ends of the day and watches the days news. Internet connectivity issues are no longer a problem.